The most recent exhibit at the School of Art Gallery sat empty for a week before curator Noor Bhangu began to install artwork. 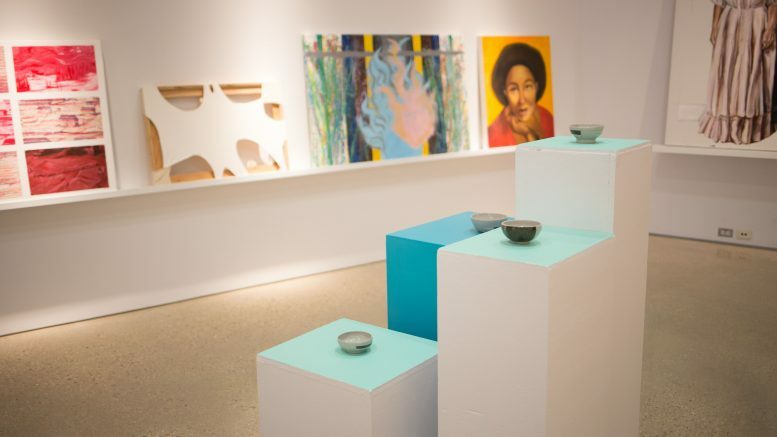 On March 15, the womenofcolour@soagallery opened, featuring the artworks of queer, trans, black, Indigenous, people of colour, (QTBIPOC) artists from the U of M and the wider community. Bhangu said the gallery was left empty for the first week to demonstrate the lack of art from women of colour she found in the school of art’s collection. Bhangu is also the gallery program assistant at the School of Art Gallery, and while she was hired to curate thematic galleries from the school’s collection, she said she found herself getting bored while sorting through it. “I found I wasn’t really interested by much stuff back there because there’s no women of colour in there, there’s three or four works by Indigenous women artists, so there’s a total lack, I feel,” she said. Bhangu said she considered leaving a gallery empty in protest of this lack of diversity, but was not sure if it would have any real impact. “Then I thought, three weeks having works from QTBIPOC students, faculty, and community members would be a generous turn on this lack [of representation],” Bhangu said. Artists are encouraged to submit works until the show ends April 13. All mediums are accepted, with Bhangu saying there is no theme to the show, other than QTBIPOC people being present in art. Former student Hassaan Ashraf is submitting a piece to the gallery that is made of all the scraps left over from his time as a student. Ashraf moved to Winnipeg in 2012 to attend the fine arts program. He did not graduate. “I was never allowed to show my work there, so for me it’s completing this whole loop of being a student there, not graduating as a student from the school,” Ashraf said. Ashraf said he was excited when Bhangu shared the submission call with him. “I’m really overwhelmed with excitement and a lot of different emotions because it brings back a lot of bad memories too, but it will definitely will bring closure for me and I’m really excited for it,” he said. Current fine arts students Annie Beach and Shaneela Boodoo said they have noticed a lack of representation in their school courses. “Even art history courses that are offered, they always cater to white male artists, and like even just the staff here is primarily white males and so just having this space and this opportunity to showcase to the students that aren’t being represented in these classes and classrooms that their work is just as valid and important and just as good as anyone else’s,” Beach said. Bhangu said she hopes the gallery will serve as evidence that QTBIPOC artists are present and active. “I know two curators who are coming down to check out what’s happening, to keep these artists in mind for future stuff,” she said. The gallery is open and accepting submissions from QTBIPOC artists until April 13.